Moog Music Forum • View topic - MIDI in? I added the dual pot last night. Works great! It does sit a bit high. I mat take it back out and cut the metal standoffs to get it closer to the board. Now I have hole in the side to add a pot for something else! As for the MIDI in, if you want to usee both MIDI or an external gate you'll need to add a diode at both inputs. For those who have used a MiniCV, are you able to get the lowest 2-3 notes to work OK? With my setup, checking the oscillator CV, it never gets to zero at the low end. As a result, the lowest 2-3 notes are all the same. I'm not sure if it's a problem with my voltage follower after the MiniCV (perhaps an offset problem) or if there is an inherent difficulty in getting down to zero. 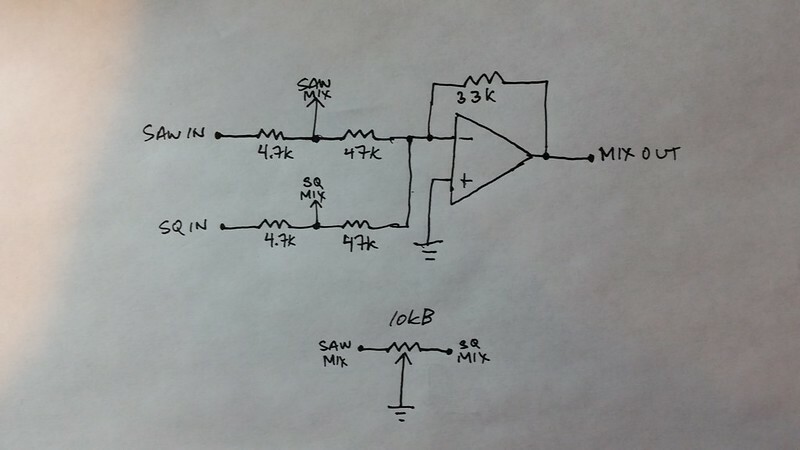 If anyone thinks it's an offset problem, is there a way to correct it besides using a better opamp? I havent noticed any issue but I'll check it out tonight. grenert wrote: For those who have used a MiniCV, are you able to get the lowest 2-3 notes to work OK? With my setup, checking the oscillator CV, it never gets to zero at the low end. As a result, the lowest 2-3 notes are all the same. I'm not sure if it's a problem with my voltage follower after the MiniCV (perhaps an offset problem) or if there is an inherent difficulty in getting down to zero. If anyone thinks it's an offset problem, is there a way to correct it besides using a better opamp? Ha ha, figured it out! The cause is a bit embarrasing. I wanted to add a diode to the buffered gate signal to prevent internal keyboard gate signals from potentially causing a problem with the MIDI gate. I also was wondering if perhaps the keyboard gate was going into the buffer's output (probably lower impedance) rather than the trigger and causing the decreased volume from the internal keyboard. So, I added a little signal diode to the MIDI gate signal. Or so I thought: I accidentally put it on the CV line. So the CV signal was totally screwed up by the voltage drop of the diode. When I moved it to the gate signal where it belonged, not only did the MiniCV have full 4-octave linearity, I also managed to fix the decreased volume when using the internal keyboard! Thanks for the offer of help, muksys! Ah, it happens. I had to add a diode to both the MINICV Gate and the External Gate in order for both to function properly. I never did get to check it out on mine because, thanks to arjanhoekstra's idea, I have successfully breadboarded a variable waveshape circuit! muksys wrote: thanks to arjanhoekstra's idea, I have successfully breadboarded a variable waveshape circuit! You gotta share that circuit! I have the VCA wired to a jack, so I didn't want to go that route. Mines a bit more of a traditional fine tune. Just a 2nd pot wired in line with the coarse pot. I think I used a 47k at the wiper. Works great. I'm going to be putting everything into a nice blogpost soon with photos and proper schematics. My Werkstatt is literally a workshop. Any mod ideas I have or others have I try out on mine before doing it to anyone elses. There's wires and circuits and clumps of solder everywhere! Im hoping to fit a MIDI implant into my werkstatt, but my problem is I'm a complete Noob! "In order to install this device you need to find some key points inside your to-be-MIDIfied instrument: power supply rail (between 6 and 15V), ground (0V), and control voltage (CV+GATE) inputs"
but feel like I need a bit more info about how this relates to Werkstatt. I have had a look at the circuit board and it's written identifiers but still don't feel confident about it. Does anyone have any tips? Is there anything major that I haven't considered? I've been looking into getting a Werkstatt to use with my Sub37 as you all have. Are you able to use the midi to put it in polyphonic mode like you can polychain a Sub37 and a couple Slim Phattys? Or, does it just work as a 3rd VCO to give you a richer/fatter monophonic sound?